The eighth comment on my February seventh post is from Annette Lunnon. She talks about a group of Church ladies that makes two hundred dolls a year to send as Christmas presents to needy children. 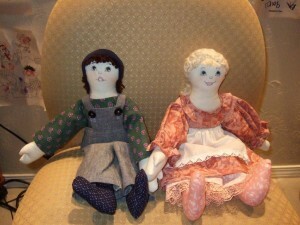 I asked her if I could post a picture of two of the dolls that were made for this project and she graciously said yes. I am amazed that the charming doll faces are drawn free hand. I spent years learning how to draw faces and place them accurately on the dolls’ heads. Now when I make a doll, I draw the original face and then trace and color it on fabric before I construct the doll. I make more mistakes on the faces than I do sewing the dolls.